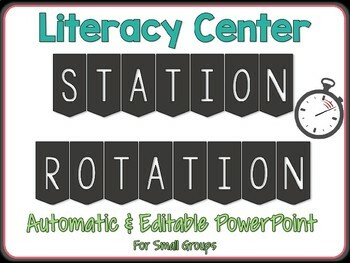 This PowerPoint contains three different editable options to manage rotating literacy centers. 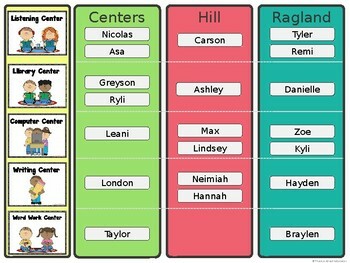 The first option is a still station rotation slide that splits a class into three different groups with one group at a teacher table, another group at a teacher table, and the third group at independent centers. 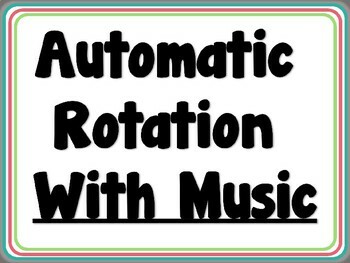 This option stays up the entire literacy block but children can go to this when it's time to switch stations and find the center they go to for the day. The second option consists of automatic station rotation slides that transition every 15 minutes and includes a one minute "STOP" slide and a "CLEAN UP" slide that lasts for 1 minute and 30 seconds. This version has music and sound to guide children as you let it do all the work! The third option is just like the second option but without the music or sounds. This option allows you to use a chime, clapping pattern, music, or whatever you'd like in the class to transition the children instead of it being embedded into the Powerpoint. The duration of the slides can be adjusted, the text and the center time pictures can be edited, moved, or deleted. 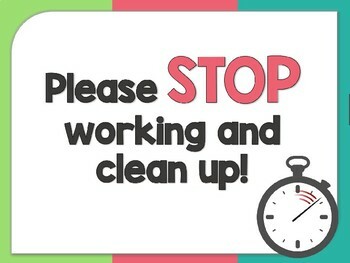 This product also comes with the matching literacy center signs to use around the classroom so both visuals will match.